Can a haircut change the world? For a while I believed the race issue in our country was so big that my actions as a white guy in a suburb of Minneapolis couldn’t make a difference. There are other people with more social and political power than this 38-year-old father of two that will get things figured out so I can continue to live my comfortable life in Excelsior. Things got turned upside-down last summer after spending time in a barber shop in North Minneapolis. I went there for a video shoot for a K-12 education client. I had no idea how a barbershop was going to serve as a backdrop for a portion of this video. I also had a lot of stereotypes to work through, like was I going to be safe? Was someone going to try and steal my camera gear? My friend and now colleague Stan Alleyne helped get things set-up, so I wasn’t too worried. My experience was totally different. The owner of the barbershop, Houston White (who has become a friend through this process) went out of his way to make me and my crew feel comfortable and even ordered us lunch on the day of the video shoot. Houston shared his thoughts about education and the achievement gap as well as different issues we are facing as a society. These conversations forced me to re-think how I approach things and how I can break out of a fairly comfortable bubble I live in. I started to think about all the choices we make every day without even realizing it. Most of these choices are based on convenience and comfort. For me, this keeps things pretty close to home for grocery shopping, going to the gym or very occasionally going to the florist to buy my wife flowers. 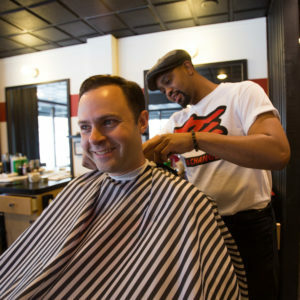 I started thinking about other choices I make – where I attend church, where I volunteer my time and where I get my hair cut. All of my decisions were keeping me around people who look, talk, think and worship a lot like me. What if I started by making one decision that was based on the desire to understand others who were outside of my bubble of comfort and convenience? Just one to start with. That’s why I now drive to North Minneapolis to see Houston to get my haircut. It’s a little thing that might not change the world overnight, but it’s changed the way I think about things. It has changed the way I speak about race and privilege. It’s changed the way I think about education and the achievement gap. It’s changed the way I read about the news in North Minneapolis. And when I say it’s changed me, I hope it has changed others. As I have conversations “within my bubble” I’m able to bring other perspectives from my experiences. This is how change starts. Parts of my business are also changing. I’m working with Stan to develop a framework for schools to use authentic student voice as a way to have conversations around the topics of diversity, inclusion and student achievement. This newfound passion was ignited for me inside of a barber shop. As you look at 2018, what’s one decision you can make that’s not based on convenience and comfort? But rather getting to know and understand others who might look, talk, think or worship differently? What if one small act could ignite a movement? What if we were the ones we were waiting for? What if a simple haircut could change the world? The Barber shop has always been considered the BlackMans Country Club, a safe haven for Black Men to discuss what matters to us. Be it politics, education, health and World issues. Once we find a shop and barber who makes us feel welcome, we tend to become a regular long term customer for that shop. I have had the same barber for over 20 years. Laramie, I’ve learned a lot about barbershops through Houston. I never thought of them as being one of the most segregated places in our country. I’m thankful for my new friends and experiences and look forward to learning more.